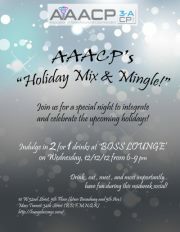 AAACP’s Holiday Mix and Mingle! Enjoy 2 for 1 drinks and celebrate the holidays with the Association of Asian Advanced Care Providers (AAACP). We are NYC’S premier Asian non-profit focused on health care, educating medical professionals and supporting the community. Whether you want to meet other young professionals, learn more about AAACP, or lush with some delicious drinks and great company, EVERYONE is welcome! Please visit our website at www.3-acp.org for more details about our organization and to support our worthy cause! No user commented in " AAACP’s Holiday Mix and Mingle! "